Don't miss this beautiful pre-owned 104' Sanlorenzo yacht for sale! : Atlantic Yacht & Ship, Inc.
Don’t miss this beautiful pre-owned 104′ Sanlorenzo yacht for sale! If you are looking for a beautiful pre-owned 104′ Sanlorenzo yacht for sale then come see this beautiful Italian yacht for sale! In the first place, “Rare Diamond” is the name of this 104′ Sanlorenzo. In a word, she has five staterooms along with accommodations for up to five crew. Furthermore, with twin MTU diesel engines, she can cruise at speeds in the mid-twenty knot range. Of course, this pre-owned 104′ Sanlorenzo is an exotic Italian Gem (as her name suggests)! Overall, this pre-owned 104′ Sanlorenzo is a great example of the quality of Sanlorenzo yachts. Her gelcoat shines beautifully and there is extreme attention-to-detail in the design of this vessel. Details include the hand-carved Wenge and bleached Anigre woods. These are contrasted by beautiful, sleek bronzed glass and reflective stainless steel. Fossilized marbles have been carved to complement the rustic beautiful of naturally time-worn stone. Correspondingly, supple leathers are used as a design element creating yet another layer of tactile contrast. Together with an extremely professional and knowledgeable crew that makes this yacht turn-key. For more information on this pre-owned 104′ Sanlorenzo be sure to contact Joe Marino today! Announcing a $700,000 price reduction on this beautiful used 104′ Sanlorenzo yacht! This 104′ Sanlorenzo 2011 is now back in Florida and ready to be seen! 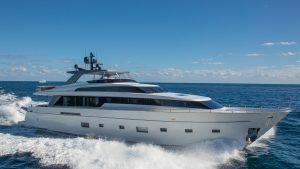 Check out this Miami Boat Show used Sanlorenzo yacht for sale! Check out this Palm Beach Boat Show Sanlorenzo yacht for sale!